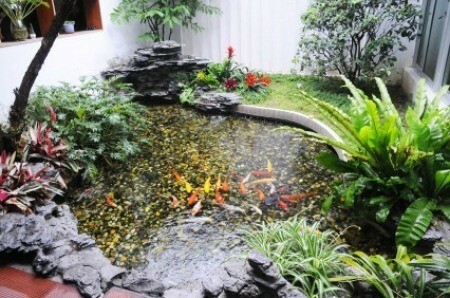 Q: I have a small fish pond in my front flower bed. It is under some tress so it gets lots of shade. In the past I tried electric pumps to filter the water but they would constantly get stopped up. I finally took the pump out and now just have the pond without any filter. Is there any product that will keep the water clear? I have cleaned the pond and put fresh water in it. I waited 3 days to put the fish back in so the water would not kill them. What is the best way to keep the pond clean at this point? I really don't get algae in the water but it is hard to keep it from turning dark. The liner is heavy plastic and the pond holds about 50 gallons of water. All ponds need some cleaning and maintenance to keep the water clear, but once your pond reaches a state of balance, cleaning and maintenance should stay at a minimal. In new ponds, water is seldom clear for very long and changing the water frequently only delays balancing the ecosystem. The keys to a balanced system are 1) a pond of the proper depth, 2) combined with a good filtration system (biological or otherwise), 3) adding the appropriate amount of plants and fish, and 4) a little bit of patience. Several things could be causing your water to look dark and murky, including algae, bottom silt, and excess waste and decaying debris (falling from the trees overhead). Make sure the soil on the bottom of your pond is covered with large pieces of slate, sand or gravel to prevent the fish from digging up the plants and stirring up silt. 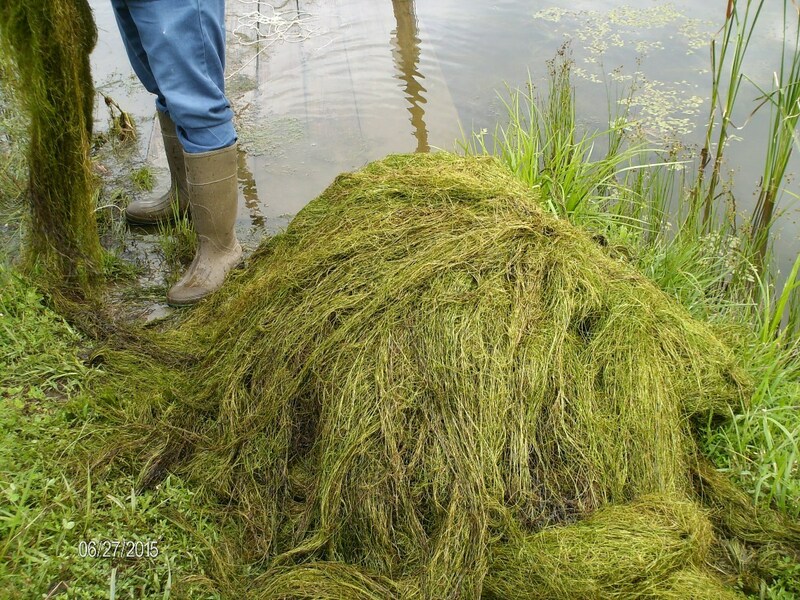 Encourage the growth of submerged plants like Anacharis, Cabomba or Vallisneria (good in shade), which will not only oxygenate the water, but filter out suspended particles. If you haven't added them already, snails, tadpoles and bottom feeding fish are also important partners in eating algae. 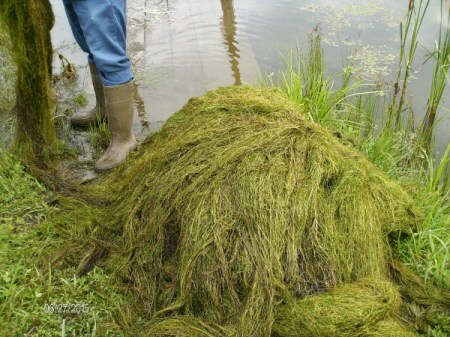 You may not think you have an algae problem, but algae can't always be seen with the naked eye. It's usually the single-celled algae (suspended in the water) that are responsible for turning it that murky green color. Light, warm temperatures and calm water are really all most algae need to "bloom." 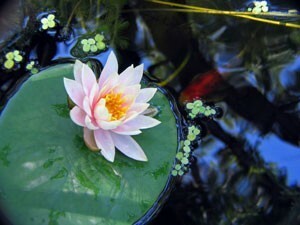 Adding surface plants, like water lilies, will keep the pond cooler and block out light to the algae as they grow. These plants, along with the submerged plants, will eventually kill off the algae by taking up the CO2 and nutrients they need to survive. In a small pond, you'll want to shoot for having at least 50-60% of the surface covered with floating plants. Also, most pond suppliers recommend that a pond with 50 gallons of water or less should contain no more than 2-3 gold fish to keep from overloading the waste cycle. Koi fish are not recommended for smaller ponds because they grow to large. Barley straw works well for keeping pond water clear. Check out Gardener's Supply Company at www.gardeners.com, and search for "barley". The Barley Pad with Flotation Frame s the product size that would be appropriate for a pond your size. The Barley Ball product description is a bit more useful, though. Good luck! PetSmart sells squares of pond water cleaner. You get 3 for about 10 bucks. You just float these cleaners in your pond, they are about 10x10 inches.